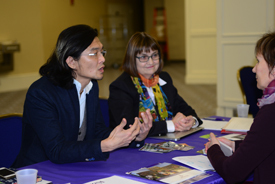 Students and emerging professionals have the opportunity to sign up for a twenty-minute practice job interview at the 2016 Annual Conference in Washington, DC. Organized by the Student and Emerging Professionals Committee, the Mock Interview Sessions give participants the chance to practice their interview skills one on one with a seasoned professional, improve their effectiveness during interviews, and hone their elevator speech. Interviewers also provide candid feedback on application packets. Mock Interview Sessions are offered free of charge; you must be a CAA member to participate. Sessions are filled by appointment only and scheduled for Wednesday, February 3, 2:00–4:00 PM; Thursday, February 4, 11:00 AM–1:00 PM and 2:00–4:00 PM; and Friday, February 5, 9:00–11:00 AM. To apply, complete the online Google Registration Form. You may enroll in one twenty-minute session. Conference registration, while encouraged, is not necessary to participate in the Mock Interview Sessions. Deadline: January 31, 2016. You will be notified of your appointment day and time by email. Please bring your application packet, including cover letter, CV, and other materials related to jobs in your field. The Student and Emerging Professionals Committee will make every effort to accommodate all applicants; however, space is limited. Onsite enrollment will be limited and first-come, first-served. If you have any questions, send an email to Megan Koza Young, chair of the Student and Emerging Professionals Committee. 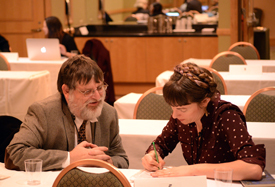 CAA’s Student and Emerging Professionals Committee seeks established professionals to volunteer as practice job interviewers for the Mock Interview Sessions at the 2016 Annual Conference in Washington, DC. Participating as an interviewer is an excellent way to serve the field and to assist with the professional development of the next generation of artists and scholars. Interested candidates must be current CAA members and prepared to give six successive twenty-minute interviews with feedback in a two-hour period on one of three days: Wednesday, February 3, 2:00–4:00 PM; Thursday, February 4, 11:00 AM–1:00 PM and 2:00–4:00 PM; and Friday, February 5, 9:00–11:00 AM. Interviewers should be art historians, art educators, designers, museum-studies professionals, critics, curators, and studio artists with significant experience in their fields or experience on a search committee. You may volunteer for one, two, three, or all four Mock Interview Sessions. Please send your name, affiliation, position, contact information, and the days and times that you are available to Megan Koza Young, chair of the Student and Emerging Professionals Committee. Deadline: January 31, 2016. 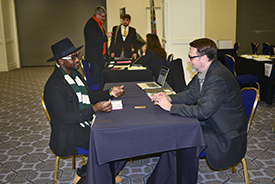 For the 104th Annual Conference, taking place February 3–6, 2016, in Washington, DC, CAA seeks established professionals in the visual arts to volunteer as mentors for two Career Services programs: the Artists’ Portfolio Review and Career Development Mentoring. Participating as a mentor is an excellent way to serve the field and to assist the professional growth of the next generation of artists and scholars. Art historians and studio artists must demonstrate significant experience in their fields; critics, museum educators, and curators must have five years’ experience. Interested candidates must be current CAA members and prepared to give five successive twenty-minute critiques in a two-hour period on one of two days: Thursday, February 4, and Friday, February 5, 2016, 8:00 AM–NOON and 1:00–5:00 PM each day. Conference registration, while encouraged, is not required to be a mentor. Please send a brief letter of interest and your CV to Katie Apsey, CAA manager of programs. Deadline: December 14, 2015. Interested candidates must be current CAA members and prepared to give five successive twenty-minute mentoring sessions in a two-hour period on one of two days: Thursday, February 4, and Friday, February 5, 2016, 8:00 AM–NOON and 1:00–5:00 PM each day. 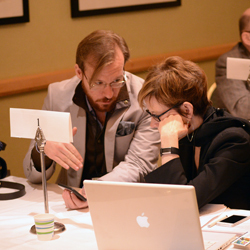 Conference registration, while encouraged, is not required to be a mentor. Please send a brief letter of interest and your CV to Katie Apsey, CAA manager of programs. Deadline: December 14, 2015.